*Raspberry, Strawberry or Blueberry can be used to add another fruit note! 1 Combine blackberries + 1 Tbsp balsamic + pepper in small bowl. Toss well, lightly mash with a fork and set aside at room temperature for 15 minutes to allow flavors to come together. 2 Preheat oven to 400º. Arrange baguette slices on sheet pan, drizzle with EVOO and toast till a light brown (7-9 minutes). 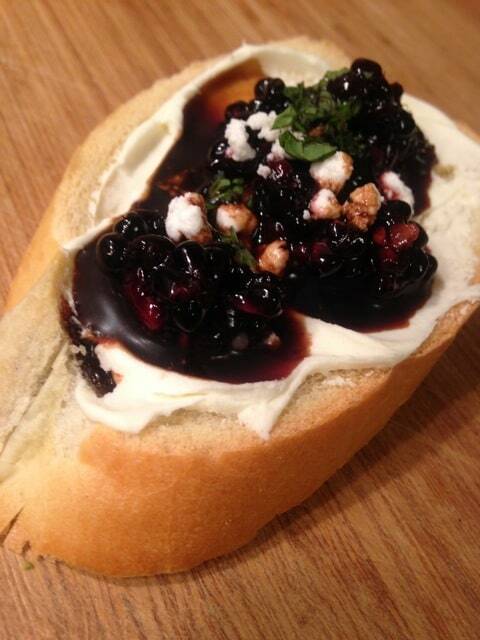 3 To assemble – smear the bread with Mascarpone, top with a spoonful of macerated berries, drizzle with balsamic and garnish with mint. Dip-style – layer toppings on a plate or shallow bowl and serve with the toasted baguette slices or crackers.